Wheel changing and correct use of the jack and spacesaver spare wheel call for some precautions as listed below. IMPORTANT If the vehicle is fitted with “Fix & Go (quick tyre repair kit)”, see the relevant instructions in the following chapter. the car is stationary in compliance with local regulations: hazard warning lights, warning triangle, etc. Any passengers on board should leave the car, especially if it is heavily laden. Passengers should stay away from oncoming traffic while the wheel is being changed. 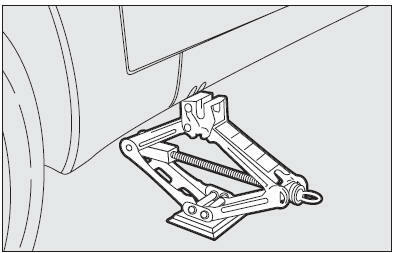 If parked on a slope or rough surface, chock the wheels with wedges or other suitable devices to prevent the car from rolling. 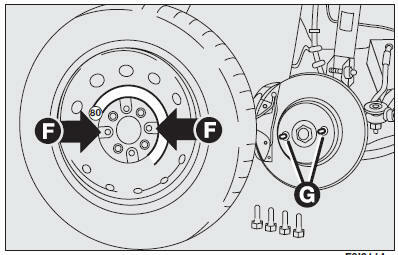 wheel is specific to your car, do not use it on other models, or use the spare wheel of other models on your vehicle. The space-saver spare wheel shall only be used in an emergency. It shall only be used for the distance necessary to reach a service point and the car speed shall not exceed 80 km/h. The spare wheel has an orange sticker that summarises the main cautions for use and limitations. The sticker should never be removed or covered. Never fit a wheel cap on a space-saver spare wheel. The sticker gives the following information in four languages: CAUTION! FOR TEMPORARY USE ONLY! 80 KM/H MAX! REPLACE BY NORMAL WHEEL AS SOON AS POSSIBLE. DO NOT COVER THIS LABEL IN USE. space-saver spare wheel fitted, the driving performance of the car changes. Avoid accelerating or braking sharply, abrupt turns or fast cornerings. The life of the spare wheel is approx. 3000 Km, after this distance it should be replaced with another of the same type. Never attempt to fit a conventional tyre on a rim designed for use as a space-saver spare wheel. Have the punctured wheel repaired and refitted as soon as possible. Two or more space-saver spare wheels should never be used together. 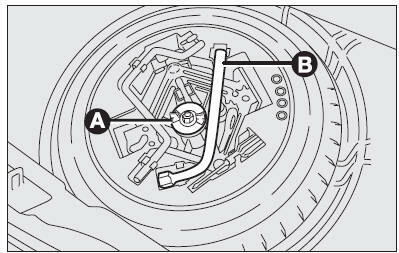 Do not grease the threads of bolts before installing them: they might slip out. correctly to prevent the wheel from coming free in motion. Never tamper with the inflation valve. Never place tools between the rim and tyre. Check and restore, if required, the pressure of tyres and spare wheel to the values given in the “Technical specifications” section. no tool other than its cranking device may be fitted on the jack. Undo the four wheel bolts and remove the wheel. 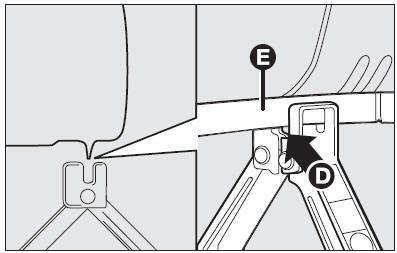 Using the wrench provided, tighten up the wheel bolts in a criss-cross fashion following the sequence shown. IMPORTANT Do not fit the wheel cap to the space-saver wheel. IMPORTANT You will need to change the set of bolts if you want to change the type of wheels fitted (alloy rims instead of steel rims, and vice versa); have this operation performed by skilled personnel. You should keep the bolts and spare wheel in case you decide to use the original type of wheel later on.